At home we’re slowly working our way through pumpkins that we harvested from the self-seeded plant that sprouted from our compost heap in the summer. Half of one down, 3½ to go!! The other night I made this dish to go with a rack of lamb – the combination of this salad with the meat was really good. When roasted the chickpeas added a yummy crunchy texture. The yoghurt dressing goes with both the lamb and the vegetables. In a small bowl mix together the cumin, coriander, Berbere spice blend, cayenne, salt and pepper. Put the pumpkin and chickpeas in another bowl, drizzle with olive oil and add most of the spice mix saving 1 tsp to go in the dressing. Toss to coat. Preheat the oven to 180°C. Tip the pumpkin and chickpeas onto an oven tray and place in the oven for about 30-45 mins or until the pumpkin is soft and browned. On a separate tray place the broccoli florets, drizzle with a little oil and sprinkle with chilli flakes if using. Bake in the oven for about 10-15 minutes. The broccoli needs to be a little brown and still a bit crunchy to contrast with the softness and sweetness of the pumpkin. 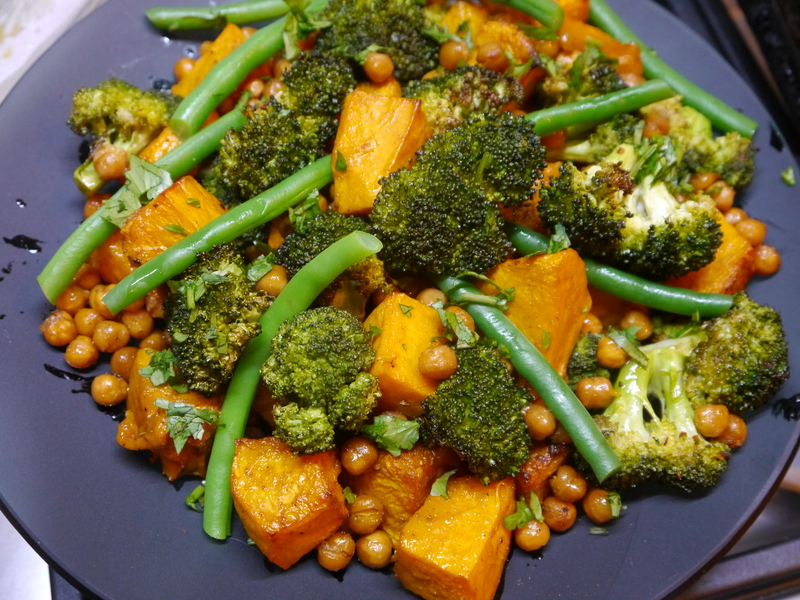 Place the pumpkin, broccoli and chickpeas on a platter, add the green beans and coriander. Drizzle with a little balsamic vinegar or pomegranate molasses while the vegetables are still warm. Mix together all the dressing ingredients with a fork breaking up and mashing the feta into the yoghurt. Serve with the salad.